Tech Talk – Corey H.
Tech Talk is a series highlighting a member of the Gophermods Family. We presented each of our technicians, managers and employees with a series of questions. These are their answers. 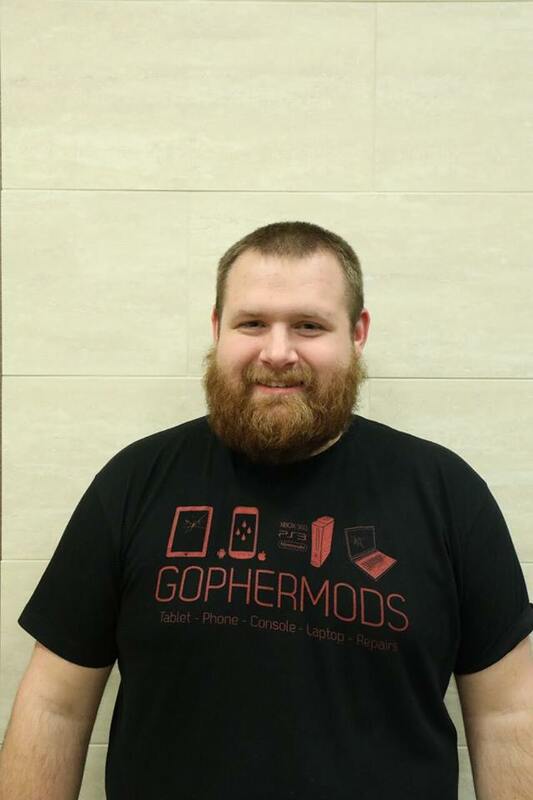 Today our guest is Corey Hoeve, an Assistant Manager at Gophermods. I’m from Albert Lea, MN. 2. What is your Job at Gophermods? Assistant Store manager at Gophermods Plymouth. Corey Hoeve is the Assistant Store Manager at Gophermods Plymouth. 3. What is your favorite phone to repair and why? The iPhone 6 is my favorite. They put it together really well and made it easy to disassemble and reassemble. Most repairs are pretty quick and easy, and for me the 6 is my favorite. 4. What is the biggest repair challenge you’ve faced? My biggest challenge has to be the HTC phones. HTCs phones are not very repair friendly at all. They have tons of cables and tape that has to be reassembled just right or things won’t work correctly. 5. What motivated you to be a part of Gophermods? I wanted to continue working in the tech field but wanted to get away from computer repair. I started out working on computers and slowly transitioned into phone and tablets. Getting tired of computers I looked into Gophermods and got hired shortly after. 6. What is your favorite piece of technology that you own? My Computer is definitely the favorite piece of tech that I own. I built it myself and have spent many, many hours enjoying it. 7. What is your current phone? I have the LG G5. 8. What do you like about your phone? The screen is just the right size for me and it’s very comfortable to hold. The battery is removable and the cameras are amazing. The fingerprint reader is a nice bonus too. 9. After repairing a wide variety of phones, is there one you would consider switching from your current one for? I really enjoy the Nexus line of phones from Google. I would consider getting the Nexus 5X. You can’t beat that pure Android experience with no carrier or manufacturer bloatware. Plus you can get on Google’s cell network called Project Fi. 10. What is the most bizarre or unusual repair you have ever encountered?